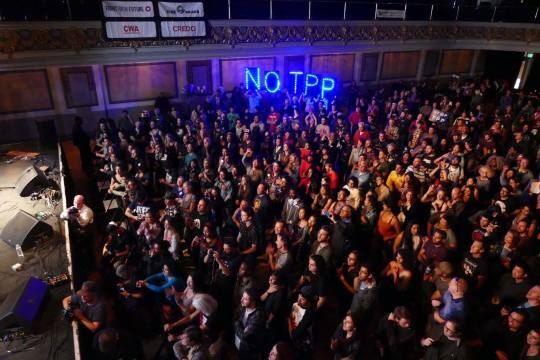 SAN FRANCISCO, CA––As the White House readies a final desperate push for the unpopular Trans-Pacific Partnership (TPP) agreement, large crowds turned out for the “Rock Against the TPP” tour stop in San Francisco over the weekend as part of a nationwide tour of large-scale concerts, teach-ins, and protests featuring high profile musicians and celebrities. Scroll down for a video clip from the event. The packed San Francisco concert at Regency Ballroom featured performances by hip hop icons Dead Prez, former Dead Kennedys singer Jello Biafra, Grammy winners La Santa Cecilia, and a wide range of other notable performers. The Rock Against the TPP tour has been drawing large crowds across the country all summer, with previous stops in Denver, San Diego, Seatte, and Portland amplified by well-known artists including Talib Kweli, actress Evangeline Lilly, punk band Anti-Flag, Danbert Nobacon of Chumbawamba, comedians Hari Kondabolu and Eric Andre, and ANTI-records songwriter Jolie Holland. See PHOTOS and VIDEO of previous events here, here, and here. Organized by legendary guitarist Tom Morello (Prophets of Rage, Rage Against the Machine, Audioslave) and Ryan Harvey’s new label, Firebrand Records and digital rights group Fight for the Future, the tour is sponsored by Backbone Campaign, Citizens Trade Campaign, Communications Workers of America (CWA), CREDO, Demand Progress, Friends of the Earth, the International Labor Rights Forum, Public Citizen, Sierra Club, SumOfUs, the Teamsters, United Steelworkers. The tour stops next at a Canadian solidarity event in Toronto on September 16th featuring Anti-Flag and Rebel Diaz, and in Boston on Friday, October 7th featuring beloved indie-pop star Mirah and Ethiopian dance-pop troupe Debo Band. Additional tour dates are to be announced.